Email me your mailing info and then watch your doorstep for your prize package! Stay tuned for more fun stuff to come! Going crazy trying to balance your life? Need a little me time? Stop by over here, leave a comment or two and be entered to win not one, not two, but THREE SAVE Certificates for a Spa Mani/Pedi at Colleen & Company! Me Time with a couple of friends? FUN da Middles! A Give Away! 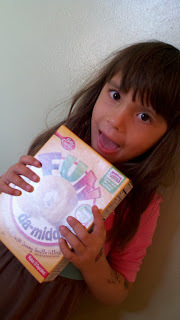 Imagine how excited she is trying Fun da Middles by Betty Crocker! What a fun idea for your next event! Perfect for the non-crafty, non-baker person like me! Think you can't pull off something like filled cupcakes? 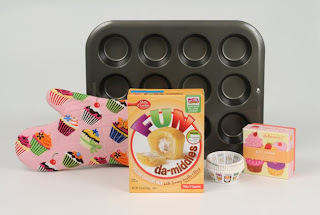 Fun da Middles makes it easy! Watch a quick video here to & see for yourself! We are entering birthday season in our house and I just know these will be a huge hit! Cake Pops & Fun da Middles anyone? All you have to do now is leave a comment to be entered to win! something else all together when you celebrate special occassions! One winner will selected via Random.org on Monday, September 26th. Click HERE to print your own coupons for Fun da Middles!